CGCG 180-023 (top), also called II Hz 4, is a superb example of a ring galaxy. Ring galaxies are believed to form when a compact smaller galaxy plunges through the center of a larger more diffuse rotating disk galaxy. 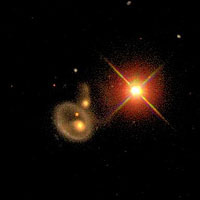 The galaxy in transit exerts a brief inward pull on the stars of the target galaxy, which execute radial harmonic oscillations in addition to their initial circular motion. A series of ring waves forms and propagates through the target disk, as numerical simulations have convincingly demonstrated. 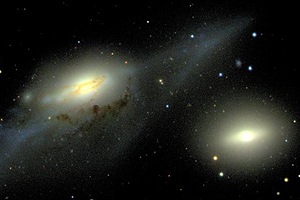 In the bottom photo, NGC 4438 (upper left) and NGC 4435 (lower left) are two members of the Virgo cluster of galaxies. The blue filaments extending from NGC 4438 indicate disruption from recent interaction with another galaxy. The obvious candidate is NGC 4435, but spectroscopic observations indicate that these two galaxies may be moving past each other too quickly to have such a strong interaction. Two hundred and seventy two stars gave their lives for the photo spread on cosmic explosions that graced pages 80 and 81 of the March 2007 National Geographic. Ben Dilday, University graduate student in Astronomy & Astrophysics, assembled these images of exploding stars from observations the Sloan Digital Sky Survey collected in 2005 and 2006. The images come in the vanguard of the SDSS II (Sloan Digital Sky Survey’s Phase Two), which focuses, in part, on supernovas. During its first phase, survey astronomers invented a new way of doing astronomy by dedicating a single telescope to mapping the universe in three dimensions. The SDSS began taking data in 1998, following years of planning by scientists at Chicago and elsewhere. The planners include Donald York, the survey’s founding director and the Horace B. Horton Professor in Astronomy & Astrophysics and the College, and current director Richard Kron, Professor in Astronomy & Astrophysics and the College. Today, the SDSS collaboration consists of 300 scientists at 25 institutions worldwide. The University has played a continuous role in the survey’s management throughout its history. Fermi National Accelerator Laboratory joined the SDSS collaboration early on. The Fermilab involvement expanded pre-existing connections that culminated last year in a major new role for the University in managing the laboratory for the U.S. Department of Energy. The SDSS collaboration built a 2.5-meter telescope for its survey, but even that relatively modest size once seemed an outlandish commitment of hardware to a single sky survey. Now, more than 20 universities, national laboratories and private organizations have banded together to propose the Large Synoptic Survey Telescope. Measuring 8.4 meters, the telescope would “provide digital imaging of faint astronomical objects across the entire sky, night after night,” according to the LSST Web site. Other observatories, including the Hubble and Spitzer space telescopes, have gradually increased the amount of survey time allocated to surveys. “It had to be done first on a smaller telescope, such as our two- and one-half meter diameter telescope,” York said. Astronomers still do targeted studies of a small number of objects in search of answers to specific questions. But now they also sweep the skies for all the data their instruments can collect and sort through it later. “It’s a sea change,” York said. Large collaborations, such as LSST and SDSS, enable participating institutions to combine their talents and resources. Chicago’s early SDSS responsibilities included integrating the survey’s spectroscopic pipeline from components contributed by a variety of institutions and helping to build a sophisticated camera for the telescope. Each of the images above shows a distant galaxy and a type Ia supernova (appearing as a bluish point). Ben Dilday, a graduate student in Physics, created the images using data obtained during Sloan Digital Sky Survey's second phase. In SDSS II, astronomers are using supernovas (exploding stars) to learn more about dark energy, a mysterious force that acts in opposition to gravity. By comparing the characteristics of type Ia supernovas from the very distant universe to similar ones nearby, scientists can estimate how the universe's expansion rate has changed throughout its history. The pipeline consists of software that processes SDSS data to identify spectral lines of chemical elements. Overseeing the integration of that pipeline was Joshua Frieman, Professor in Astronomy & Astrophysics and the College. Playing a lead role in building the camera was a graduate student of York’s, Connie Rockosi (Ph.D.’01), who now teaches at the University of California, Santa Cruz, as an assistant professor of astronomy and astrophysics. Rockosi discovered, with SDSS data, that old star clusters have tidally stretched streams of stars as they move around the galaxy. Three other students of York’s also were involved, noted Kron. Brian Yanny (Ph.D.’89) helped build the SDSS imaging pipelines and was co-discoverer, with Rockosi and others, of the “lumpy” distribution of stars in the halo of the Milky Way galaxy, which led to a new paradigm of formation of the galaxy. Dan Vanden Berk (Ph.D.’97) and Gordon Richards (Ph.D.’00), wrangled new data from quasi-stellar objects. Astronomers believe these extremely bright objects to be galactic cores that produce enormous quantities of energy. Vanden Berk helped build software pipelines and defined the spectra of QSOs to a new level of precision. 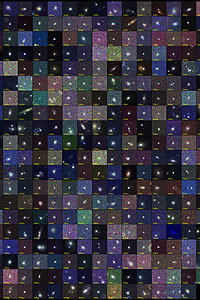 Richards started checking the accuracy of SDSS selection of QSOs from images and ended up leading the effort that defined the final computational instructions for obtaining them from the data. He also led the development of a technique for obtaining distance measurements of QSOs using only five-color images of the objects, without needing spectra. When York and Kron began discussing the potential of an ambitious sky survey in the late 1980s, its prospects appeared uncertain. York had learned secondhand of an idea to point a spare telescope mirror at Polaris (the north star) to look at all the objects surrounding it in the same field of view. This would allow the scientists to then track variations with time and obtain a super-deep image of that part of the sky by adding up all of the separate exposures. “Rich had been thinking about these things, too, but nobody knew how to do it,” York said. At the time, the development of electronic light sensors called CCDs (charge-coupled devices) were not yet capable of recording wide-angle telescopic observations of the sky. But York and Kron decided to explore the possibilities anyway. With a colleague, Jim Gunn, of Princeton University, they called two meetings at O’Hare International Airport, consisting of a dozen astronomers from across the country. On their agenda: how to record the positions of a million galaxies to achieve their ambitious goal of mapping the universe in unprecedented detail. The sky survey project lost momentum following the O’Hare meetings. Then one day Jeremiah Ostriker, chair of astronomy at Princeton University, said, ‘I think maybe ARC could do this,’ York recalled. “I was shocked,” he said, laughing at the recollection, because the sky survey would be a much larger project than any yet undertaken by ARC (Astrophysical Research Consortium). ARC owns and operates the Apache Point Observatory in New Mexico, which became the home of the survey’s 2.5-meter telescope. The striking dust lanes are the most prominent feature of this disk galaxy, seen nearly edge on. The disk appears to be slightly warped at the far edges, a feature that is more pronounced in radio images. 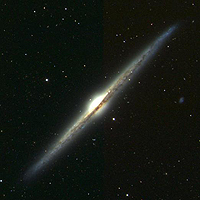 NGC 4565 has a clear bulge, but little light can be seen in from its halo. Ostriker broached the sky survey concept with Marvin Goldberger (Ph.D.’49), who was then Director of the Institute for Advanced Study in Princeton. York and Kron flew to Princeton one Saturday to discuss the project with Ostriker, Gunn, Goldberger and John Bahcall of the Institute for Advanced Study. The institute subsequently provided the survey’s first seed money. While Don Lamb served as department chairman from 1988 to 1991, he devoted nearly half his time to what was then called “The Map of the Universe” project or the “Digital Sky Survey.” Lamb, the Louis Block Professor in Astronomy & Astrophysics and the College, developed the seed funding required at the time to keep options open for casting the mirror for the project, which, along with the CCDs were the two critical-path items for the project in 1988. Lamb also helped rally funding support for the project, both at Fermilab and within the University administration, including two provosts and then-President Hanna Gray, the Harry Pratt Judson Distinguished Service Professor Emerita in History and the College. He first approached Fermilab Director John Peoples about the project in December 1989. “John recognized immediately the scientific promise of the project, and the ways in which Fermilab might contribute significantly to it,” Lamb said. Other Chicago scientists also contributed critical support in a variety of ways. Among his several roles, Stephen Kent, Assocate Professor in Astronomy & Astrophysics, served as one of the SDSS “founders” at the early O’Hare meetings. He now heads Fermilab’s Experimental Astrophysics Group. Edward Kibblewhite, Professor in Astronomy & Astrophysics and the College, contributed ideas for the funding proposal. In his former capacity as Dean of the Physical Sciences Division, Stuart Rice, the Frank Hixon Distinguished Service Professor Emeritus in Chemistry and the College, played an important role in supporting ARC and successfully launching SDSS. And serving on oversight boards were Edward “Rocky” Kolb, the Arthur Holly Compton Distinguished Service Professor in Astronomy & Astrophysics and the College, and Michael Turner, the Bruce V. and Diana M. Rauner Distinguished Service Professor in Astronomy & Astrophysics and the College. Argonne National Laboratory Director Robert Rosner, the William E. Rather Distinguished Service Professor in Astronomy & Astrophysics and Physics, and the College, helped develop the first programs looking at stars in the SDSS. In 1992, the Alfred Sloan Foundation made the first of its $25 million in commitments to the survey. Additional funding came from the National Science Foundation. Fermilab also had pledged support. Fermilab already had a theoretical astrophysics group, founded by the late David Schramm, the Louis Block Professor in Astronomy & Astrophysics at Chicago. The group pioneered a new field, particle astrophysics, which brought together scientists who study the universe with those who study subatomic particles. But with the advent of the SDSS, Fermilab also launched an observational astrophysics program. Following Fermilab’s successful involvement in the SDSS, other national laboratories, including Los Alamos and Lawrence Berkeley, started astronomy programs as well. And Fermilab itself has since expanded its observational astrophysics program to include the international Dark Energy Survey collaboration. That effort seeks to measure the mysterious force causing the universe to fly apart. Frieman, who is a member of the Fermilab Theoretical Astrophysics Group, is leading the Chicago component of that collaboration. “The Dark Energy Survey is going to build upon the experience of the Sloan Digital Sky Survey,” Kron said.